Unbiased, Unsponsored. Who Cares? Hopefully You. 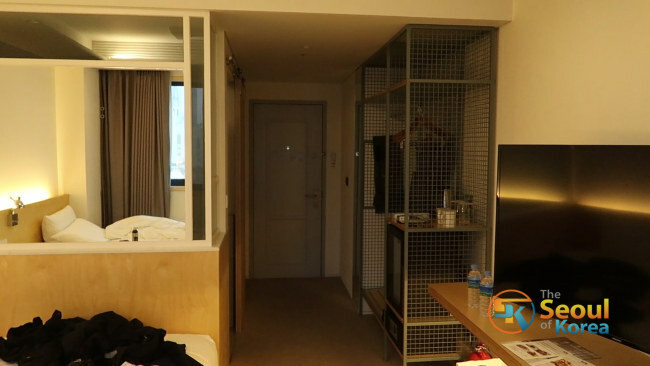 I got the chance to stay at the Glad Live Gangnam, a category 4 hotel. The hotel category rating system starts from 1 to 5, with 1 being worst and 5 being the best. The hotel is part of the SPG Design Hotels. You will find the hotel at 223 Bongeunsa-ro, Seoul, 06109 in South Korea. The hotel is located in the middle of a busy city block in Seoul, which I thought was weird. My first thought was that the hotel could have been built at a better location. However, Seoul is known for its busy modern streets. It is a challenge to get to the hotel if you are driving a car. Walking, getting a taxi, riding a bus and even taking the train is easier to get to the hotel. If it is your first time staying at the hotel and you are driving, it might be a overwhelming experience. I booked a three (3) day stay at the hotel for 108,500 won a day for a total of 358,050 won and tax was included. That is about $328 total. I got a Standard twin bed separated non-smoking room. I even got to use my SPG member benefits. 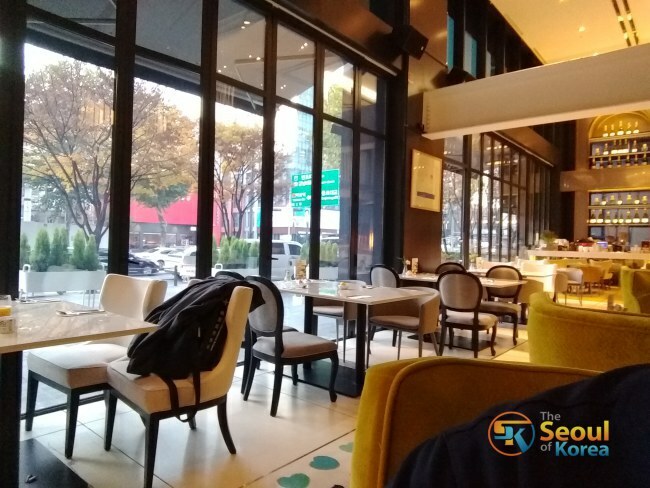 So what was the benefits like with the SPG Gold Elite Status at Glad Live Gangnam Hotel? I charged it to my SPG American Express Card. I have SPG Gold Elite Status with both the SPG American Express and American Express Platinum, it didn't seem I got anything. The receptionist said I would get a free gift, but I didn't see it in the room. The room was booked as a twin and that's what I got. I paid the complimentary breakfast rate and that's what I got. The SPG Gold Elite Status didn't seem to give me any perks at the hotel. The parking is W5,000 for each time you park the car and take it. What Did I Get Included With My Stay Each Day? Check in was 15:00 PM. It was a bit disappointing because I thought it would be earlier. Hotel check in time is standard at 16:00 so it wasn’t bad. Complimentary Breakfast each day of your stay (W25,000 value) - The food is actually good. 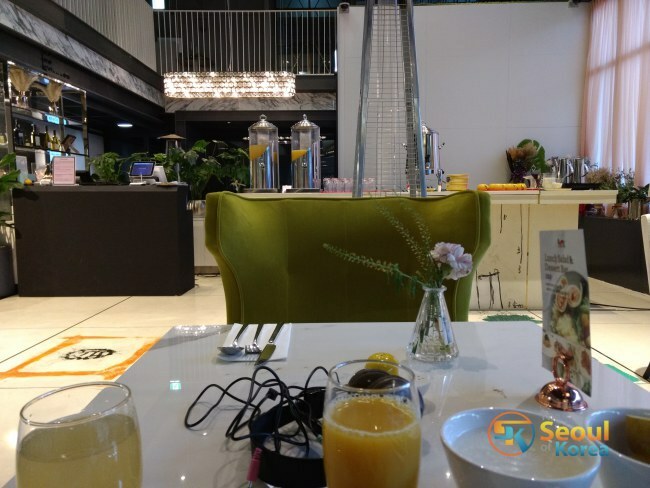 There was a good selection of food, bacon, eggs, hash browns, salad, fruits, rice porridge, soup, cheese cake, mini croissants, coffee, apple juice, pear juice, water, milk, cereal and more. Free Wi-Fi in the room. It was adequate to stream youtube videos and netflix. The gym is 24/7. A bit small, but I liked it because there was no one there 03:00 AM in the morning working out. Air conditioning and heating works good. The bed was very comfortable. I had the choice of two beds in the room. I used the right bed to place my clothes and camera gear. I slept on the left bed, since it was right next to the window. As usual with hotels, I expected to see the mini bar, and I wasn't disappointed. The mini bar was there. I didn't touch anything from the mini bar because they are overpriced. There was a mini fridge with a see through door containing two daily complimentary water bottles. I took those. It is free after all the money I spent staying at the hotel. I went to a local mini store that was about 100 feet away. Go through the hotel’s main entrance, take a right and it is located about 100 feet away. I stocked up on groceries from there. I bought W40,000 of grocery. That was better than spending W40,000 for a dinner at the Glad Live Gangnam. The prices of their eatery within the hotel is a bit expensive. The main receptionist lobby is located on the 4th floor. You check in at the hotel on the 4th floor. The 2nd and 3rd floors 3 contains the art market. The hotel’s restaurant and the complimentary breakfast is located on the 1st floor. The main entrance is on the 1st floor as well. The ground floor and 1st floor can be used interchangeably if that gets you understand. They have a valet parking service if you have a car. Just give them the keys and they will valet park it. Had to negotiate the busy street when leaving or entering the hotel. The hotel does its best to provide a unique experience, but you would have to book a stay there and see for yourself. It's a great place to stay at the last minute when you need a hotel room fast and quick. As for me, I rather stay at the IHG COEX, Seoul Parnas, Banyan Tree. It’s you that assists in keeping us motivated to stick up overdue throughout the night time burning the candles and writing. This was a “Glad Live Gangnam Hotel Review. How Is It?”, by Gyopo “TactiCool Reloaded” Oppa. Sarang Haey Yo! See You Subsequent Time! Preventing!